T.W. Sherrin’s ball is 730 millimetres in circumference and 300 millimetres long. It’s as unique as a unicorn and one of the defining pieces of our great game. The life of a Sherrin would be a rollercoaster ride. From the figurative highs of being kicked through the big sticks in front of thousands of fans, to the lows of being battered and bruised from hitting fences and fists alike. 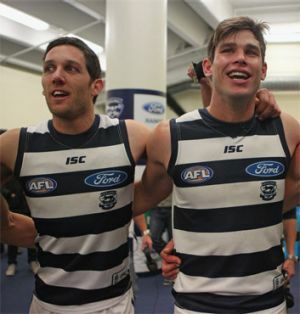 In last Thursday night’s rollercoaster, the Cats played in a game where the Sherrin travelled mostly in one direction and spent a lot of time in the hands of the men in red and white. The fine lines of football are an intriguing thing. We were soundly beaten by a terrific team. Be off slightly and you can be badly exposed, even to the tune of 110 points. You learn from victory, but you learn much more from defeat – about yourself as well as your team. My yoga instructor spoke recently about our aversion to pain and traction to pleasure. His words reminded me of the value in balance. To not over-celebrate victory, nor drown too deep in loss. Review, learn, then move on to the next challenge that lies ahead. It was very relevant advice after last Thursday night. Yoga has taught me a lot of things, including how to appreciate times of intensity. As my hamstrings stretch to their limit I learn about intensity and how to try to breathe through it. It is a short exposure that I try to use to help prepare for the backs-to-the-wall situation. How will we handle the intensity of a final? How much further can we push ourselves late in a game to get our team over the line? I shake and struggle with my hamstrings on stretch for a very short time, but that time provides rewards that are more than just physical. I have also come to appreciate the quieter times in my world. Albert Einstein said: “The solitude of a quiet life stimulates the creative mind.” Rafael Nadal says he enjoys fishing, more specifically “the peace and quiet of being at sea”. Quiet times help the body rest and prepare for intensity. My “sea” is my car on the drive to the ground on match day. I metaphorically cast a line on these trips and enjoy the calm of my mind. Colours seem brightest and clarity is best. The intensity of the battle ahead looms large, but I am able to just breathe and relax, as if waiting for something to grab on to my line and wrestle my thoughts back from the horizon. That something will be the MCG this Friday night. Suddenly “fishing” will be distant thought, and what we need to do to play our best comes front of mind. Another of those times is the intimate moments spent with your teammates after singing the team song. The body aches and the physical toll of battle on many is clear to see, but there is a feeling of satisfaction that is shared among men you have just chased, tackled and bled with. Before reality strikes and recovery must start for the next challenge, this time is one I cherish. The feeling of satisfaction post victory is heightened when you reflect on the preparation that came before the final siren on game day. Acknowledging achievement is vital in order to instil confidence and reinforce positive behaviours. But how much acknowledgement is healthy? How many pats on the back are too many? The balance is hard to find but a necessity for sustained success. On the other side of the coin are the feelings that accompany defeat. How much venom should words contain after a loss? How much finger-pointing is too much? Again, balance is key. The arc of the emotional pendulum that swings between victory and defeat should be constant. Over-feel fulfilment or linger on friction? If victory is over-celebrated and defeat is met with too much misery, the swings of the pendulum reach extremes. The good times are amazing but the bad times can be unbearable. A Sherrin’s life is one of great highs and lows. A footballer’s existence can be similarly tumultuous and short-lived. To give yourself the best chance to prosper, isn’t it better just to keep the pendulum swinging?